There are quite a few variations on hip flexion and extension flows from down dog. Here’s one called Monkey Tail. Start in Downward Facing Dog. As you inhale, lift one of the legs up toward the ceiling, bending into the knee as you lift. As you do this, pull the chest bone towards the front of your mat and look forward. Pay attention to the low back as having the knee bent makes it easy to arch the back too far. If you feel any discomfort, back off. As you lift the leg, head, and chest, you build strength and flexibility in the muscles along the whole spine. As you exhale, bring the knee in toward the nose, and nose in toward the knee. As you do this, you continue to work the low back muscle, and as you complete the crunch, you use your abdominal muscles as well. Exhale, knee in toward to nose, nose toward the knee. Repeat for anywhere from 3-12 breaths, depending on how you’re fitting it into your practice. Make sure you balance it out on the other side! 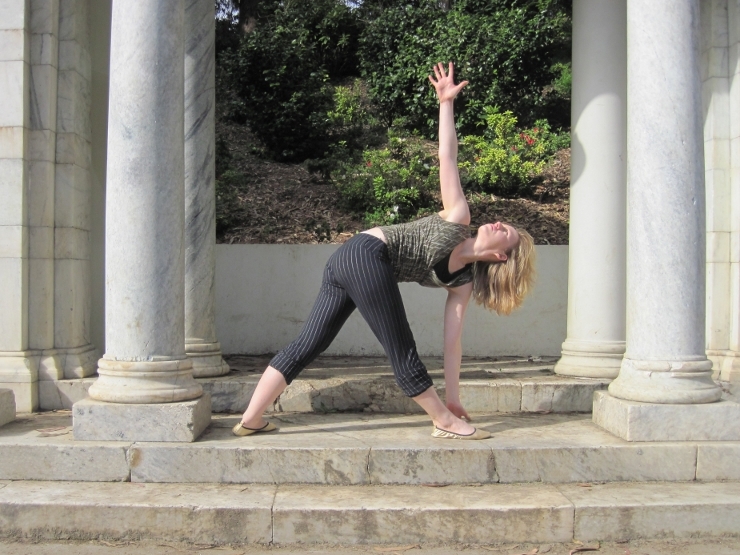 To add a challenge to your vinyasa, you can try this single leg variation. 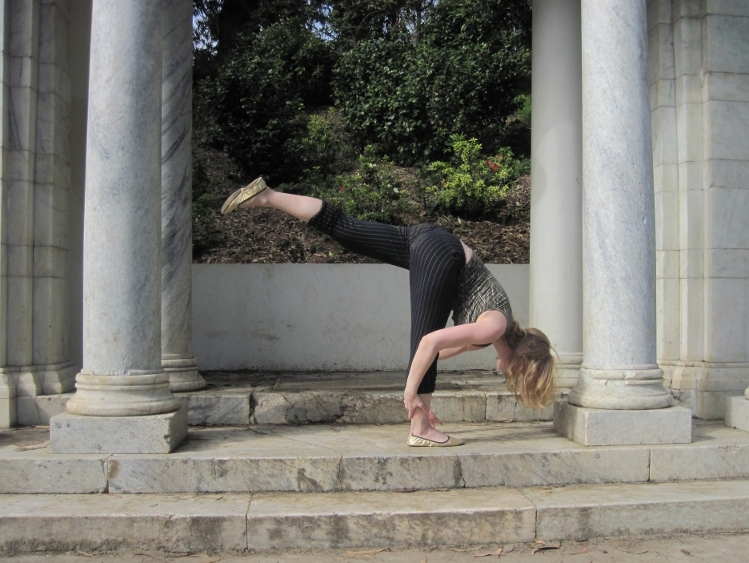 Feel free to switch to a two-legged vinyasa at any point during this sequence–some of the transitions are harder to do one-legged than others. Begin in a plank with one leg lifted. If you’re incorporating this into a larger flow, one-legged plank can follow naturally from downward facing dog with one leg lifted or from side plank with the top leg lifted. Begin in plank with one leg lifted. Keeping the leg lifted, as you exhale lower slowly to chuttarunga. Keep the abdominals contracted, elbows close to the body, and shoulder blades sliding down toward the hips. In chuttarunga, the torso should not sink below the level of the upper arms as this can put the shoulders into a bad position. 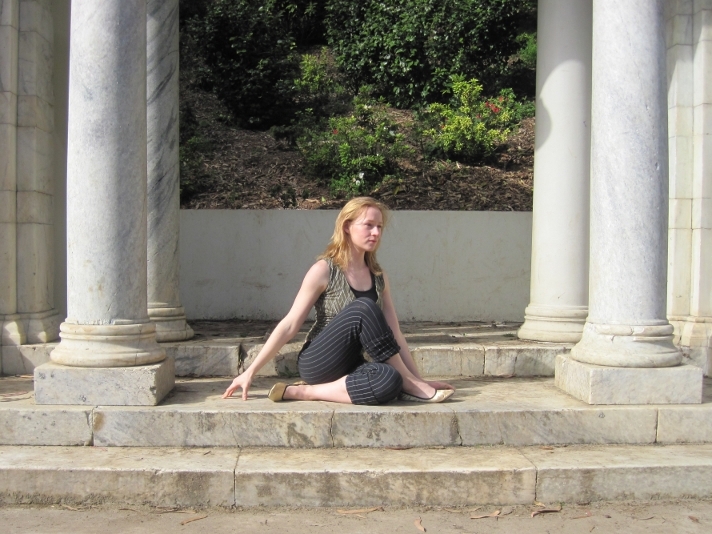 Exhale, lower to one-legged chuttarunga. Contract the abdominals to protect the low back, and as you inhale pull forward into upward facing dog. If you can, keep the leg lifted. Notice that you have to roll over the toe so that the top of the foot is on the floor. 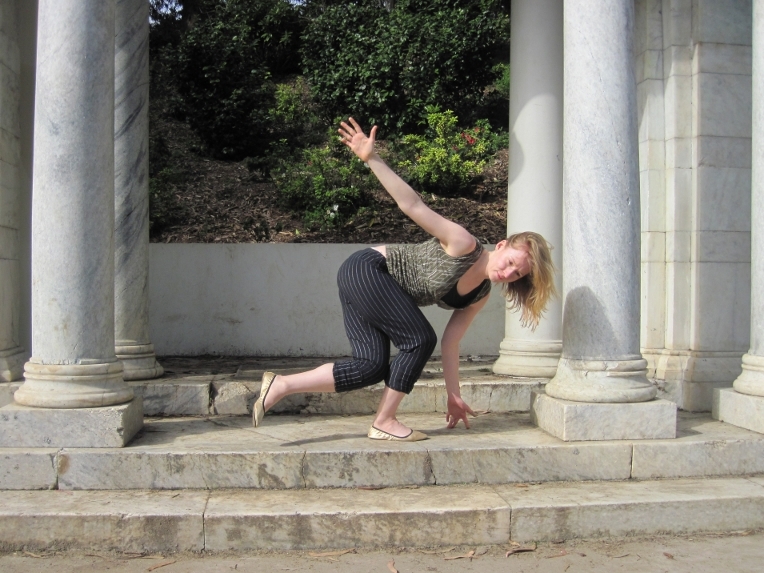 In upward facing dog the quads (muscle in the front of the thigh) are contracted so that the hips are lifted. Squeeze the shoulder blades back and together, and slide them down the spine. Inhale, lift to one-legged upward facing dog. This next part is the hardest. Rolling back over your toe requires you to use your tibialis anterior muscle in the front of your lower leg, and this muscle is often quite weak. You can lower the lifted leg here if you need to. Here we go: contract the abdominals (you’ll need them!) and as you exhale press back to a downward facing dog with the leg lifted. Exhale, press to one-legged downward facing dog. From here you can go all sorts of places: pigeon? High lunge? A warrior? Handstand? That’s up to you! Here’s another one I came across in San Francisco. I’ve seen dancing cat before (from hands and knees, extend one arm and the opposite leg on an inhale, then bring elbow to knee on an exhale), but this is a fun variation. From hands and knees, extend the leg out behind. 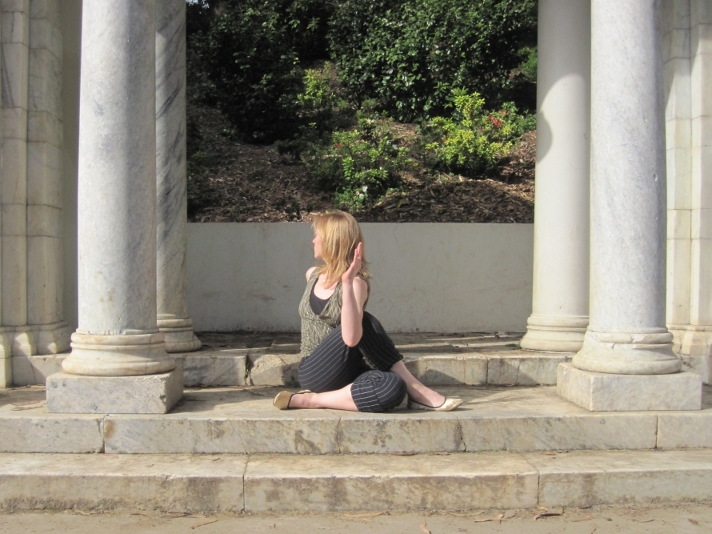 As you exhale, bend the elbows, keeping them in close to the body. Bring the chest down toward the floor. The same leg stays lifted throughout. Keeping elbows in close to the body puts the focus on the tricep muscles instead of chest muscles. It also keeps the shoulders rolling forward. As you inhale, straighten the elbows, lifting the chest away from the floor. The same leg is still lifted. Now, as you exhale, bring the knee in toward the nose and nose in toward the knee. This motion works the abdominal muscles, especially if you really round through the spine: think about tucking the chin and tail bone under and drawing the belly button back toward the spine. As you inhale, extend back to the starting position, re-engaging the low back muscles, glutes, and hamstrings. Repeat the flow as many times as you like on this side, and then balance it out on the other side. Return to the starting position. Repeat the flow.